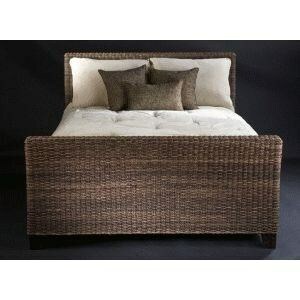 Make your bedroom into a tropical oasis with this natural abaca frame bed. The natural abaca frame features a woven design. The natural finish subtly adds a tropical feel to any bedroom decor. The Visions Queen Bed by C.S. Wo & Sons at C. S. Wo & Sons Hawaii in the Hawaii, Honolulu, Oahu, Hawaiian Islands, Waikiki, Diamond Head, East Honolulu area. Product availability may vary. Contact us for the most current availability on this product. Create a home that reflects your laid-back attitude and relaxed yet chic style with the Visions collection. The bedroom and occasional pieces are made from natural abaca weave with wood frames and metal brackets for a durable and inherently tropical look and feel. The Natural Abaca finish highlights warm, rustic tones, while clean lines establish contemporary design elements. The Visions collection is a great option if you are looking for Tropical furniture in the Hawaii, Honolulu, Oahu, Hawaiian Islands, Waikiki, Diamond Head, East Honolulu area. Browse other items in the Visions collection from C. S. Wo & Sons Hawaii in the Hawaii, Honolulu, Oahu, Hawaiian Islands, Waikiki, Diamond Head, East Honolulu area.